The bespectacled publisher, with lines coming out of his head just like the ones Peter Parker gets when his Spider-Sense tingles, looks out of the panel and snaps his fingers. This is a 1947 pamphlet, Secrets Behind the Comics, written by one Stan Lee. Two years after the war ended, with superhero comics in terminal decline, it’s not a completely unreasonable way of remembering things. Superman and Batman did a little bit of Nazi bashing; Wonder Woman a little bit more. But Captain America, the Human Torch and the Sub-Mariner — the flagship characters of Goodman’s Timley Comics — did indeed spend 1942-1945 fighting the Nazis. Once the war was over, they rather fizzled out. There was an attempt to revive them as cold warriors in the 50s, presumably to make the reading public aware of the dangers of Communism, but it didn’t take. It’s feasible to claim that “superheroes who fought the Nazis” was Timley comics Unique Selling Point. 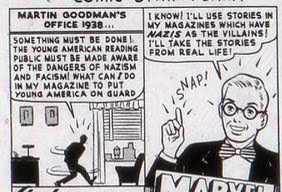 But any suggestion that, four years before the war, the idea of anti-Nazi comics came to Goodman in a flash of inspiration doesn’t stand up to much scrutiny. Marvel Comics #1 came out in 1939: no-one fought any Nazis. In 1940, Jupiter, King of the Gods sent his only son Mercury to earth to defeat the evil Pluto, who was disguised as Rudolph Hendler, dictator of, er, Prussland. It wasn’t until 1941 that Captain America punched an undisguised Hitler on the jaw — eight months before Pearl Harbour, true, but three years after Goodman had his epiphany. And Captain America certainly wasn’t created by a publisher or a publishing house; he was created by two artists, Joe Simon and Jack Kirby. They were Jewish Americans and presumably not big fans of the Nazis; but by their own account they made Hitler the villain because it was more fun to pit their hero against a real-life monster than a made-up one. Timley Comics gradually became the publishing house in which Captain America, the Sub-Mariner and the Human Torch fought Hitler, through a process -- a process which took a number of years. A decade later, Stan Lee imagined the whole process being conceived by one man in one single eureka moment. And there we have the paradox and the tragedy of Stan Lee: his conflict with his collaborators; his mainstream fame; his deteriorating reputation among comic book fans; the decades of failed post-Marvel projects; the increasingly bizarre Hitchcockian cameos in movies he had nothing to do with. Stan Lee believes in Origins. He wasn’t the first person to use the term “Origin” to mean “the story of how a superhero acquired his amazing powers”. DC had published a comic called Secret Origins in 1961, and The Origin of the Superman/Batman team in 1958. But Lee made the word his own. A Marvel Superhero is defined by his Origin -- so much so that if you accidentally create a character whose beginnings are shrouded in mystery, someone else will step in and correct your amusing error a few weeks later. The “we” is disingenuous. The first episode of Doctor Strange was created by Steve Ditko entirely without input from Stan Lee. He was a wizard. He lived in modern-day New York: hipster Greenwich Village, in fact. He helped out people who were in trouble. What more did anyone need to know? 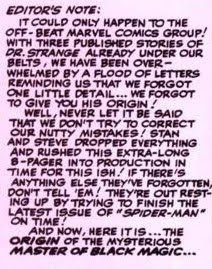 The caption is a public reprimand from Lee to Ditko for starting a story in media res rather than ab initio. The Origin of Doctor Strange is Lee taking over Ditko’s character and putting his own mark on it. Lee’s retrofit turns Ditko’s mysterious wizard into an arrogant surgeon who studied magic in Tibet after his hands were shattered in a car accident. It adds nothing to the character, except telling us why he is Doctor Strange. Ditko had wanted him to be Mister Strange, but that was too much like Mister Fantastic. (I thought medical etiquette was that surgeons were addressed as "Mr" rather than "Dr"? Couldn’t he just have had a PhD in occult studies?) Dr Strange never mentions his medical background again. There was a pilot for a TV series in which he would have been a medical student who cast spells in his spare time. John Mills was his teacher, the Ancient One. He called Steven Strange “grasshopper”; very nearly. Introducing a character without a back story certainly wasn’t the sort of thing that could only have happened at Marvel. Batman first appeared in Detective Comics #27. For the next five issues, everyone just accepted that Bruce Wayne's hobby was dressing up as a flying mammal and arresting criminals. The Bat Man - Who He Is And How He Came To Be finally appeared in Detective Comics #33. 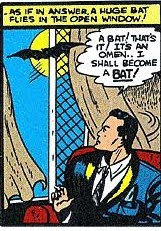 Bruce Wayne is famously shown trying to think of a name for his vigilante identity, when he has a eureka moment of his very own: "As if in answer a bat flies in through the open window". Evangelical Christianity places very great emphasis on The Testimony -- an oral performance in which the Convert narrates the story of their Conversion. If you do not have a narrative about how you were once a Sinner, but at a particular moment chose to turn your life around and follow Jesus, you are probably no Christian, however pious you happen to be right now. A superhero's Origin is a little like his Testimony: the defining story of his life, to be revisited in endless recitations and flashbacks. The Origin recounts how at one time the hero was a normal person (very possibly disabled or disadvantaged in some way) but that at a particular moment they acquired supernatural powers. Since those powers almost always come through accident or blind chance, there is usually some subsequent moment at which the empowered person positively decides to use their powers to do good. Paternal deaths are particularly good value. Books about writing often tell us that a good story involves some change in the main character: they should be a different person at the end of the story from the one they were at the beginning. The Origin is the only point in most super-lives where this kind of character development happens. The episodes which follow are generally about protecting or restoring the status quo. That is why movie makers endlessly boot and reboot characters Origins. It's the only thing they can really recognize as a story. A superhero is defined by his Origin: everything else flows from it. It follows that the person who dreams up the Origin winds up the spring that sets the comic book in motion. The hundreds of issues which come afterwards are inevitable: preordained. Stan Lee seems to believe that something very like an Origin happens in real life. Just as there is one simple story which tells you why Peter Parker is Spider-Man, so there is one simple story which tells you why Stan Lee dreamt up Spider-Man. If Timely comics were about superheroes fighting World War II then there must have been a moment at which someone said “Hey! Let’s do a series of comics about superheroes fighting world War II.” If Spider-Man was young, and if he had realistic dialogue, and an annoying old Aunty, well, there must have been a single moment when the idea of a realistic young superhero with an annoying old Aunty leaped into someone’s head. Wherever we ended up; that was where we were always heading; and we knew where we were heading when we set out. The acorn really is the oak tree. Stan Lee is a story teller, and 60 years on, he has turned what were doubtless messy, vague, contingent brain-storming sessions into a series of creation myths. Creation myths which sound awfully like...well...superhero origin stories. "And I saw a fly, walking up the wall." A bat! That's it! An omen! I shall become a BAT.